To inquire about, or sign up for a session, please scroll down and fill out the inquiry form at the bottom of this page. Crystal bed therapy is a unique feature of the Casa de Dom Inacio, in Abadiania, Brazil. 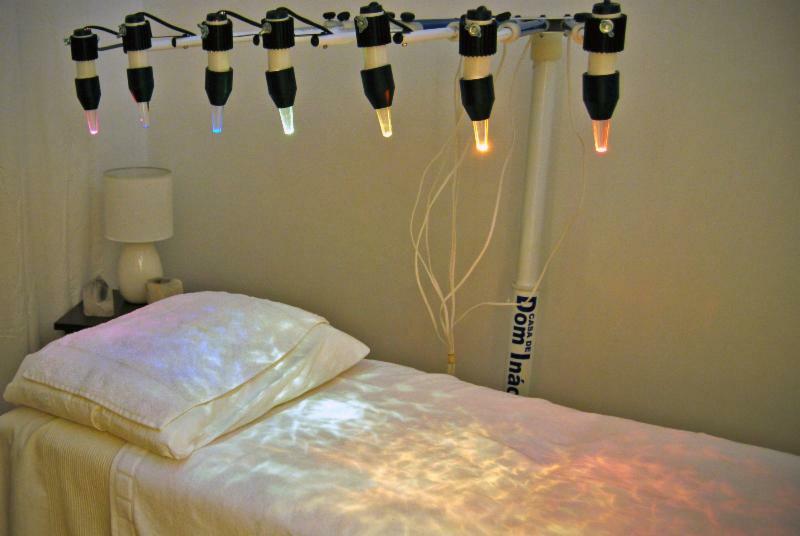 * A crystal bed has 7 quartz crystals suspended above the client who is lying, fully dressed, on a bed or massage table. 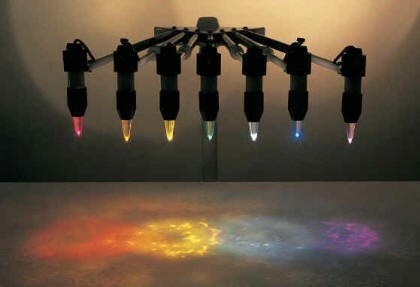 They radiate light in characteristic colors and sequences and align with the seven human energy centers ("chakras"). See also here for more information about crystal beds. It is well recognized in the healing arts that light, colors and sound each have therapeutic effects. A crystal bed session synergistically combines the effects of harmonically directed pulsated light, in harmonizing colors, and soothing sound vibrations under the umbrella of spirit directed healing intentions. The crystals radiate color to the respective chakras in certain frequencies and rhythms to harmonize and balance their energies. The sound bites are especially selected by the Entities at the Casa de Dom Inacio. The Entities often prescribe crystal-bed therapy in preparation for, or in conjunction with, a "spiritual intervention" (a healing originating from loving, highly evolved beings in the nonphysical realm). Providing an original Casa crystal bed therapy outside of the confines of the Casa -- with the specific blessings of the Entities** -- is like bringing part of the Casa de Dom Inacio to you, the client. It is a privilege for us to be able to serve you in our Sunnyvale and Sea Ranch healing practice in this unique way, where you can receive this presence of the Entities without actually traveling to Brazil. The seven crystals of a crystal bed shining onto the surface on which the client is lying. A single crystal bed session (30 minutes) is charged at $50. Your first (single) crystal bed session includes an energetic client assessment and is charged at $70. We offer series of three 45-minute sessions at $150. * Gundi and Klaus Heinemann are official Group Leaders of the Casa de Dom Inacio in Abadiania, Brazil, and regularly lead groups to Abadiania. Contact them if you are interested in participating in such a trip. ** Klaus and Gundi purchased the Sunnyvale crystal bed at the Casa de Dom Inacio in Brazil in 2008 with the expressed blessings of the healing Entities, and have since then made it available to hundreds of clients with wonderful results. They installed a crystal bed in Sea Ranch in early 2015 and invite you to to take advantage of this Northern California opportunity. If you would like more information, fill out the form below, and one of us will get back to you. Crystal bed sessions are offered in Sunnyvale and Sea Ranch, California. Press here for our Refund Policy. Comments: please be specific about your inquiry, including date(s) and location (Sunnyvale or Sea Ranch) of your Crystal Bed session, and special circumstances you wish to be considered. The more specific you are, the better we can serve you.